Mars Express has been at Mars since January 2004, and its mission has already been extended a couple of times. Under an agreement with NASA, Mars Express was required to maintain a specific orbital configuration during the descent of Phoenix to Mars so that all three of the Mars orbiters could listen for Phoenix' radio signal. Now that Phoenix is safely on the ground, Mars Express' mission controllers are free to shift the spacecraft's orbit so that it can view new targets, namely, Phobos, the inner of Mars' two moons.Mars Express has already taken lots of images of Phobos, but the vagaries of orbital mechanics have prevented it from getting a good look at the trailing hemisphere of the moon (the side of the moon that faces backward along its orbit around Mars). Since the trailing hemisphere is where the Russian sample return mission Phobos-Grunt is supposed to touch down, it's imperative that we get better maps of that region than are available from Viking, which did image all of Phobos but perhaps not at the resolution that the Russian space agency would like to see. Mars Express captured these views of Phobos on January 20, 2006. The larger view was taken by the Super Resolution framing camera of the Mars Express HRSC instrument, which produces significantly blurred images. The smaller view was taken by the HRSC pushbroom camera at the same time. Mars Express will shortly be getting better views of the trailing side of Phobos (toward the right side of the globe in this image) thanks to a shift in its orbit. 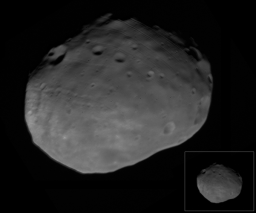 or context, Phobos is approximately 27 by 22 by 20 kilometers in size, so although these are relatively close, none of the flybys comes closer than about four Phobos diameters from the moon; and in fact most are more distant from Phobos than Mars Express' minimum orbital distance to Mars, which is about 260 kilometers. According to the release, ESA has been treating these encounters differently from routine science operations; they're planning them much like the Cassini team plans its flybys of Saturn's moons, optimizing the timeline to make the most of Mars Express' instrument package and get the most science return. Tomorrow's flyby will include lots of imaging with the HRSC camera (which is capable of color and stereo views). The release also states that tomorrow's flyby may include images of the future landing site of Phobos-Grunt, which is exciting news -- it means the closest flyby is happening over the relatively poorly imaged trailing side of Phobos. If this were a NASA mission I could be confident that we'd see images online within days or even hours of the flyby. But this is ESA and they don't do things the same way -- they don't release raw versions of their images, and they often wait for scientific publications (which can take many months) to release just a few pictures. But I just asked project scientist Agustin Chicarro about the plans for image releases, and I am delighted to report that they have every intention of releasing images the day after the encounter! So stay tuned for that. 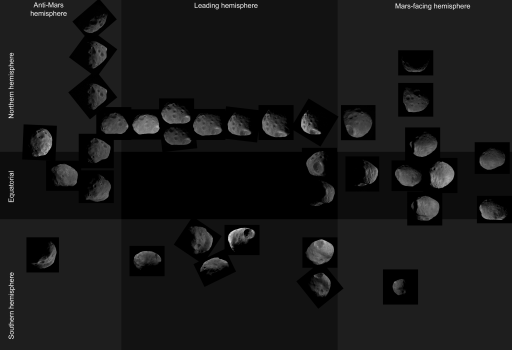 In the meantime, enjoy this montage I put together a while back, showing what Mars Express has managed at Phobos to date.